Home » Italy » Solo In Venice! I spotted her from the vaporetto on my way back from Santa Maria della Salute. 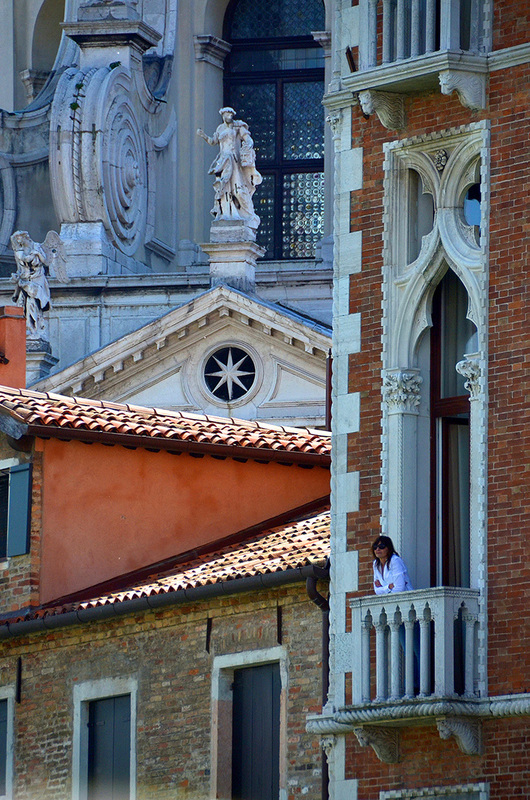 Her lone self on the balcony of the Palazzo Genovese (now the Centurion Palace Hotel) overlooking the Grand Canal, and juxtaposed against the glorious details of the church beyond. What a fabulous vantage point from which to survey the panorama below! I admit I felt a wee bit envious. Stay tuned for more from Venice when I return from a short trip to Coonoor over the weekend. And I booked some dump at Piazzale Roma 😀 I usually clone people out from my photos, but I like the fact that a human figure (female) is on that balcony. It shows us what Venice today is all about – visitors. Fabulous shot!